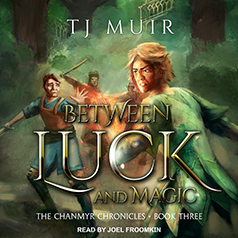 TJ Muir presents the third book in the Chanmyr Chronicles series. Hak'kar is a dangerous and vengeful man. Jedda, a former spy with a price on his head, has learned this too late. Now, driven away from the two people he loves most, Jedda is on the run with the only two friends he can trust. He is hunted everywhere. And to make things worse, his newly awakened magic is becoming dangerous to himself and everyone around him. As hard as things are, his Luck seems to be guiding him to new friends and possibly even a safe place to call home. But larger forces are at work. Standing on the cusp of everything he's ever dreamed of, Jedda finds himself caught between Luck and Magic. And that may be more dangerous than even his worst enemies. Can he learn to control his magic before someone gets killed?